Defected In The House in association with Bomba Events joins Carnival Cities to host two Saturday night parties in LAB at Sankeys this month. 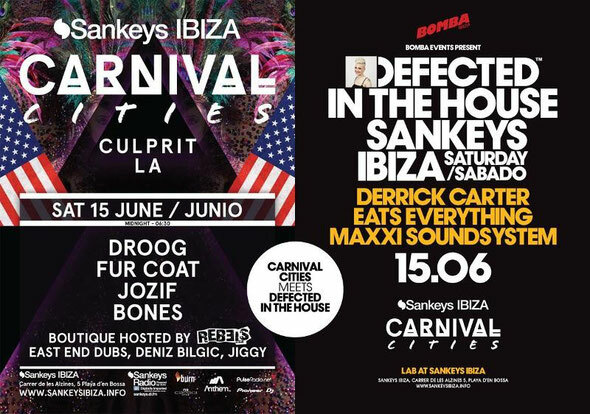 After three weeks of free workers’ parties in the Savannah Back Room, Bomba Events and Defected recently announced two Saturday night Defected In The House parties at Sankeys Ibiza with Carnival Cities on 15 and 22 June. The Defected In The House line-up on 15 June will be Derrick Carter, Eats Everything and Maxxi Soundsystem, while on 22 June Dennis Ferrer, Lil Loius, Sonny Fodera and Frank Rizardo will be taking control of proceedings. LAB at Sankeys will see Defected In The House host one room with Carnival Cities alongside Culprit (15th) and The Underground (22nd) in the Basement, with performances from Finnebassen, Droog, Fur Coat, jozif, Him_self_Her, Jobe, BONES and Rebels. Simon Dunmore (Defected): “Making the best out of the delayed Bomba situation we have held three successful workers’ parties at Savannah in San Antonio. Now this collaboration with Sankeys Ibiza over the next two weekends is a perfect opportunity to continue the party and allow more people to experience Defected In The House in Ibiza.